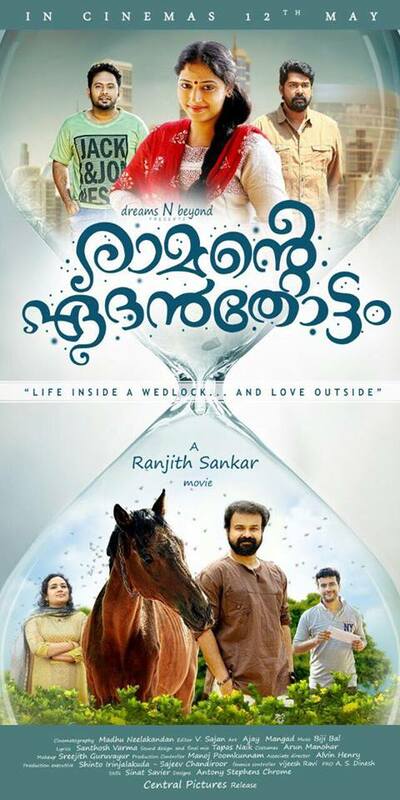 When did i first think of making Ramante Edanthottam? On the morning of the 2nd day I took a jeep for a trek to Mampara. The Jeep driver struck me immediately. He had a big stick to scare away tigers and elephants:). We reached the peak after a great ride and I felt I was so close to nature.I was still working in software then.It was like a new world opening up before me.. In the 4 days that I stayed there I was pretty sure I was gonna shoot a romantic movie there. I could smell romance all around there. Raman was formed there as a skeleton from a combination of that jeep driver and that resort owner. Years passed and I visited the resort every time I passed through Palakkad. I would drive upto Nelliyampathy and be there for few hours to feel Ramans world. It was a scary movie to make, so I kept it aside every time. After Pretham I suddenly felt if I don’t make it now may be I might never make it in my career. Chackochan (Kunchacko Boban) was equally excited to be Raman and even agreed to spend 3 months for preparation. Sadly by the time I wanted to shoot it ,the resort in Nelliyampathy was not fitting enough.Across the years it had transformed into something modern, not Ramans world. I thought I may never find Ramans Edanthottam. Then it was Bijibal (popular music composer) who suggested Vagamon Heights. He had composed for Munthirivallikal Thalirkkumbol over there. I write dialogues for my movies very late. I went to Vagamon Heights while I was through half of it and weeks into shoot.The moment I reached the place I could see the scenes playing out in front of me there. The mud paths,rustic rooms,lakes, mountains, estate, forest.. the place even had the horse and dogs that were there in my script.It was like a location waiting for me ready to shoot there. The moment I saw the place all little apprehensions in my mind regarding the movie had faded away. It was destined to be made and to be shot there.I only had to follow the flow..I have experienced this in a few films and the moment you realize it you are relieved. The world will conspire for the rest to fall in place.. I still didn’t have a heroine. Many leading stars were ready to give both their hands to be Malini. But somehow I felt only the freshness of a newcomer can make it work. I met 100’s of newcomers but nothing clicked. Anu Sithara happened to come on board just days before the shoot.I went to meet her to say a polite NO.But the moment I saw her I saw Malini.I gave her a dialog and it turned out that she was indeed Malini. There was no looking back from there. I am writing this when I am on this fag end of my journey through this film. All I can say is that I am in love with it right now. I want to be detached from it as soon as possible so that i can take your views on it realistically. Note: Ranjith Sankar is a prominent writer,director and producer, having made well known Malayalam films like Passenger, Arjunan Saakshi, Molly Aunty Rocks, Punyalan Agarbattis, Varsham, Su Su…Sudhi Vathmeekam and Pretham.